Perseus, the brightest cluster of galaxies in the X-ray region, located some 250 million miles away has at its center a black hole. The Chandra X-ray Observatory has discovered that surrounding the black hole is a ripple effect of waves of hot cluster gas. 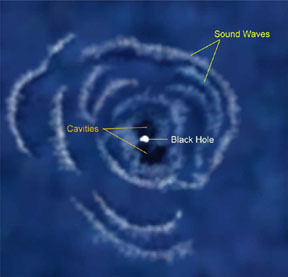 According to NASA, these ripples can create sound waves as they travel hundreds of thousands of light years away from the cluster’s central black hole. In musical terms, the pitch of the sound generated by the Perseus black hole translates into the note of B flat or A sharp. But it is not something we can hear. Not only is it far away but the sound frequency it makes is a note 57 octaves lower than middle-C. This is a frequency that is over a million, billion times deeper than the limits of human hearing, and the deepest note ever detected from an object in the universe.